I've been unable to locate the surname of my MGGM. My mom (who got the information from her aunt...my maternal great aunt and one of my MGGM's daughters) tells me the surname is Virgola, but I've been unable to find it on any ship manifest. I've been able to locate a few ship manifests on my MGGF, Vincenzo Ali, as he came to America a few times before marrying my MGGM and raising a family, of which my MGM, Teresina Santa Carmela Alia, was one of their daughters. What would be my next step? Grazie. Lynne, we need to get you the Birth Act for one of the children which will clearly list the name of your MGGM. This is the only way I can think of. Have you been to the Cosenza Archives site? Maybe you can find something there. 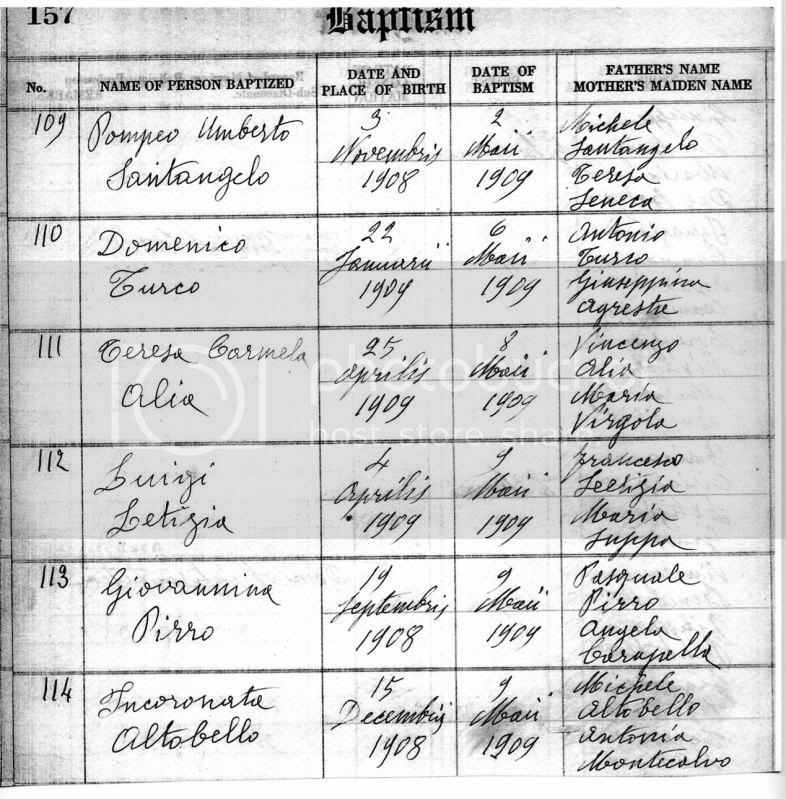 Why the Cosenza Archives if my MGGM was born in Caulonia? However, I did type in her name, birth year, and place of birth, but came up with nothing. I have no idea why I linked that site to you! I think I must have been half asleep or something! I'm sorry. Hey, what do you think of the above entries? The name does say Virgola, right? Thus, my confusion as to why I've been unable to locate the name on any ship manifest...unless, of course, it was spelled incorrectly. Any ideas? This one has me stumped but we will crack it. I love summer but hate the limited research options available. I was actually going to check out my FHC tonight but they're also closed because its a long weekend here (Civic Holiday) so perhaps next week. We will figure this out. You're a sweetheart, Nuccia! I hope you know how much I appreciate all of the help you've been to me thus far...the knowledge you possess is irreplaceable. I know this mystery will be solved at some point...my patience has certainly been tested for sure! BTW...what exactly are the summer months with regard to the Reggio archives? Oh you are so welcome! I wish I knew more but I have so many wonderful people to help me here and that I can call on for advice. I think that as soon as the sun comes out, Italy goes on holidays but officially I know the mid August EVERYTHING shuts down or works on a skeleton staff. A friend just mentioned last week about the Reggio Archives since he researches there weekly so I will ask him for more information. My husband has also been home all week and as much as I love him, its such a pain in the you know where when the spouse is around. They want your full attention which is hard sometimes. Thank God he goes back to work on Tuesday! Will try to be up early on Saturday morning before everyone and see if I can contact some friends. And yes, the email won't hurt. You never know unless you try. Did you include your address int he email? I find they sometimes like to mail responses back instead of emailing. Lets face it..before September we will all be at the mercy of "Italian Holiday Hours". I don't even send for requests anymore before then..nor do I send requests in December. It has just occured to me that some Comunes will not release certificates unless they receive proof of identification from the person seeking information. I know that I have sent letters fo individuals to a variety of Comunes and Have always included a photocopy of either a driving license or the info page of a passport. They are funny here about the Privacy Laws. Some seem to have adopted their own Provincial versions of the National Privacy Laws and are really 'hot' and yet others, it would seem, don't even give it a thought. So, I guess what I'm saying is - include a photocopy of an ID document with your requests. It can't do any harm and may just be the 'key' to gey helpp from some offices. Thanks for the info, Nuccia. And, yes...I did include my full name and address in the e-mail (along with my telephone number...just in case!). And, Carole...thanks for the very helpful tip about including proof of identification along with my request, which definitely makes sense. If and when I decide to re-send my letter to the Comune di Caulonia, I will include a copy. I was just curious of how your search has gone? Hi Nuccia, From what I understand, Maria was born in 1882, so I'm fairly certain this isn't her. See why I'm going crazy?! Virgola...Rivoli...argh! Thank you, though. 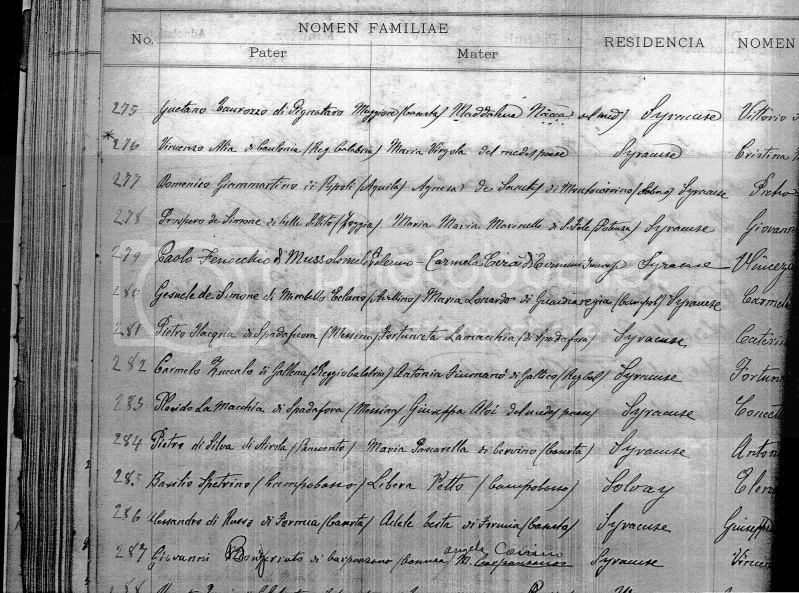 What census records have you found and can you remember how they were indexed?